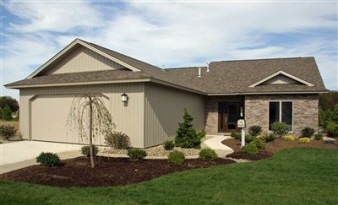 Description: Model home - price shown is base price. Design and custom build your dream home to your specifications from $195,000 in approximately four months. Features in this home include a spacious great room with large dining area, eat-in kitchen with snack bar, stainless steel quality appliances, custom cabinets, and pantry, sun room/den, large master bedroom with full bath, double sink vanity, huge walk-in closet with built-in wardrobe chests, second bedroom with full bath, large laundry room, insulated garage with door operator, floor drain, hot and cold water, and pull-down stairs to overhead storage, beautifully landscaped lot with patio and much more. Ridgefield features a state-of-the-art clubhouse with service kitchen, exercise room and heated olympic-sized pool.